First of all allow me to direct you to my girlfriend’s blog, and her post about Hurricane Sandy. In short, her parents live a few blocks from the bay on Long Island, and her childhood home flooded with about 2 feet of water last night. So if you’re the praying type, keep her family in your prayers. If you’re the thinking type, keep them in your thoughts. 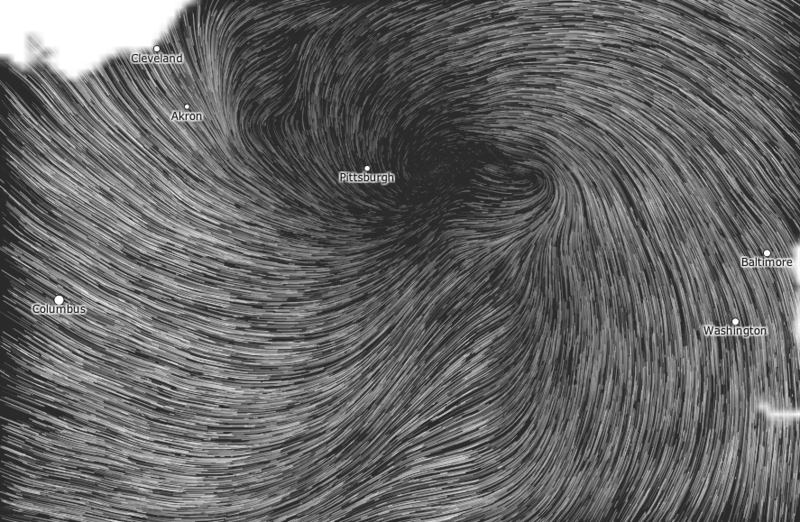 I discovered this jaw-dropping, mesmerizing US wind map this morning via Discovery News. This fascinating animation is created by streaming realtime wind speed and direction data from the National Digital Forecast Database and feeding it into software that then generates the animation, graphing out the wind as lines across a map of the U.S. The image at the top of this post is a screenshot of the remnants of Sandy. When you visit it, be sure to click on the map and zoom in on the center of circulation. Get really close- it’s truly mesmerizing. Things like this have always fueled my fascination with weather.